Without a doubt, Sonic Mania is considered to be one of SEGA’s best releases from the past couple of years. Unfortunately, Sonic Mania was a digital-only release, which disappointed a couple of people (including me *sniff sniff*), but that all changes today! During today’s panel at SXSW, SEGA announced Sonic Mania Plus, which is a physical release of Sonic Mania with some bonus content. On top of an already fantastic game, players can control Mighty the Armadillo and Ray the Flying Squirrel. There is also an “Encore Mode”, which changes the visuals of the game and allows you to experience Sonic Mania in a whole new way. Additionally, “Competition Mode” now allows up to four players, and the more the merrier as I always say! 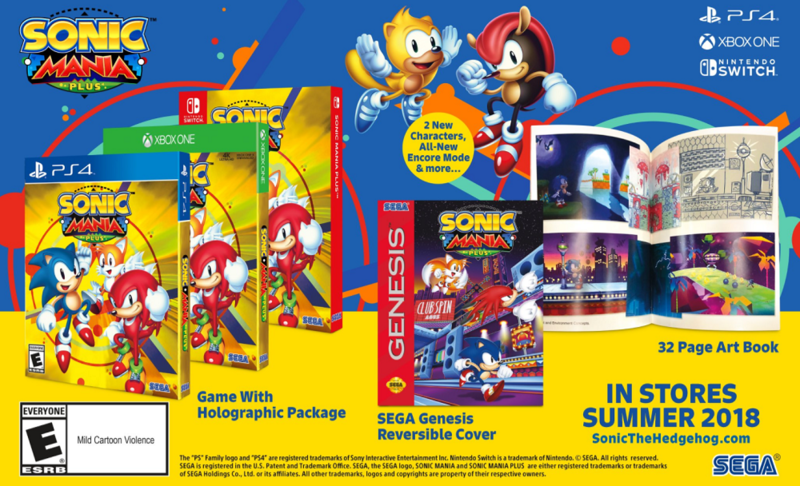 Sonic Mania Plus will come in a deluxe packaging, featuring a holographic slip cover, 32 page art book, and a reversible cover to make it look like a SEGA Genesis game! You can get all of this goodness for only $29.99 ! If you already own Sonic Mania, SEGA will release an update that adds the new content to your game. No pricing has been announced yet.